Cayenne, also called capsicum, generally refers to red peppers with pungent to hot and spicy flavors. 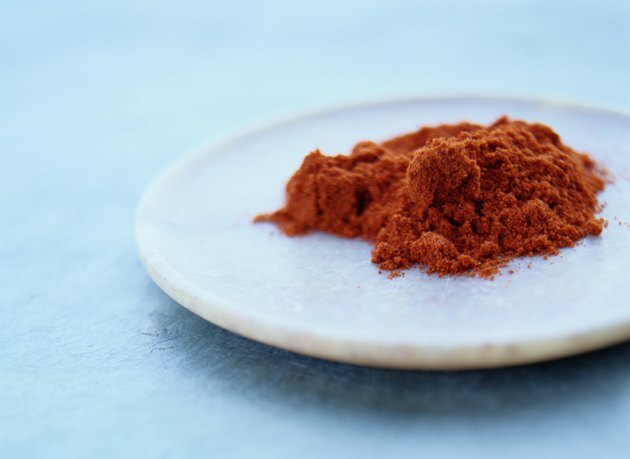 The spiciness of cayenne depends on the concentration of capsaicinoids, alkaloid compounds that irritate skin and mucous membranes. Red peppers and chili peppers have higher levels of capsaicinoids, whereas paprika has lower concentrations. Talk to your doctor about side effects from cayenne, which comes in supplement form but is also common in curries and spicy dishes. Normally, your immune system uses white blood cells to attack only disease-causing substances. In cayenne allergies, your immune system incorrectly identifies a capsaicinoids as dangerous and stimulates mast cells to produce histamine to help destroy them. Histamine is what causes you to feel allergy symptoms in your nose, throat, respiratory system, skin and digestive tract. Allergic reactions occur immediately or a few hours after exposure and may result from consuming even a small amount of cayenne. Early signs of a cayenne allergy include throat tightness, hoarse voice, wheezing, cough, nausea, vomiting, stomach pain and diarrhea. You may get a runny nose or experience a skin rash called hives. Hives are raised, red welts that appear on your skin's surface and are usually itchy. Some people are born with cayenne allergies, while others develop problems over time. Allergies are frequently hereditary, so ask your relatives if they have difficulties eating cayenne or red peppers. A severe, life-threatening allergic reaction to cayenne is anaphylaxis. Your immune system releases a system-wide flood of histamine in anaphylaxis, which results in a drastic drop in blood pressure known as shock. Symptoms of anaphylaxis include a weak, rapid pulse, skin rash, nausea and vomiting. You may also feel warm, get a lump in your throat, have difficulty breathing or feel a sense of impending doom. Go to the emergency room immediately if you suspect anaphylaxis, because it causes unconsciousness and death if untreated. Try a heart-rate self-test if your symptoms are mild or unclear. Place two fingers on your wrist bellow your thumb until you can feel blood pulsing. Count the number of pulses in 10 seconds, then multiply by six to get beats per minute. Normal heart rate is between 52 and 70 beats per minute. Consume cayenne after the initial pulse test then wait for 15 to 20 minutes and retake your pulse. If your pulse increases by more than 10 beats per minute you may have a cayenne allergy. Avoid cayenne for a month to see if symptoms subside. How Much Cayenne Pepper Should One Take?